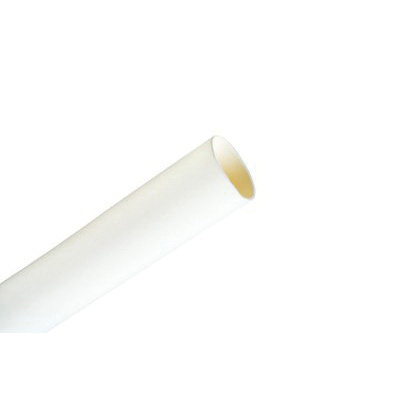 3M Thin-wall heat-shrink tubing in white color, features flexible polyolefin construction that insulates the conductors to ensure safety from abrasion as well as environmental factors. This 0.025-Inch thick tubing of dimension 3/8-Inch OD x 4-ft, has shrink ratio of 2:1. It is suitable for 600-Volt rated applications. This tubing is expandable up to 0.375-Inch Dia. It withstands 900 Volt/mm dielectric voltage and 2400 psi tensile strength. This tubing allows for 175% elongation for 336 hours at 175 deg C. It will not drip, flow, crack for 4 hours at 250 deg C. This tubing comes with volume resistivity of 10^15-Ohm/cm. It has low temperature flexibility rating of -55 deg C, minimum shrink temperature rating of 100 deg C and temperature rating of -55 - 135 deg C. This tubing with 0.2% water absorption capacity, is ideal for lightweight wire-harness covering, fire-resistant covering, wire marking, wire bundling and component packaging applications It is self-extinguish flammability rated. Heat-shrink tubing is UL listed, CSA certified, RoHS 2011/65/EU compliant and meets SAE-AMS-DTL-23053/5, Class 1, 2, AMS 3636, AMS-3637, ABS standards.